Holotrichia longipennis Blanch. (Coleoptera: Scarabaeidae) is a serious pest of commercial crops in Siduwa, Dhankuta, Nepal. Seven indigenous isolates of entomopathogenic nematodes (Steinernema lamjungense LMT5, S. lamjungense SS4, S. everestense DKP4, S. abbasi CS1, S. sp. KL1, Heterorhabditis indica CK2 and H. indica CK6) were used in a series of bioassays against the insect. All isolates showed an increased dispersal in response to H. longipennis. Nematodes were more attracted towards third instar larvae than to second instars. Differences in penetration and multiplication in the insect were observed amongst the seven isolates. Steinernema lamjungense LMT5, S. everestense DKP4 and S. abbasi CS1 caused greater mortality than other isolates to different developmental stages. Pupae and second instar larvae were more susceptible than third instar larvae. Significant differences were observed in LT50 values of the isolates against different stages of H. longipennis. 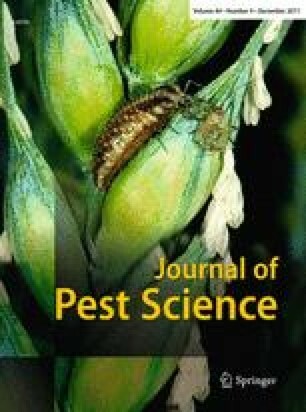 Three isolates (S. lamjungense LMT5, S. everestense DKP4 and S. abbasi CS1) along with a commonly used insecticide (chlorpyrifos) were tested against this insect in pot and field experiments. In pot experiments using maize and cabbage as a host crop, S. lamjungense LMT5 and S. everestense DKP4 performed better than S. abbasi CS1 and yielded a mortality comparable with chlorpyrifos. Similar results were observed in field experiments 3 weeks after nematode application. These experiments overall suggest S. lamjungense LMT5 to be a promising biocontrol agent against H. longipennis followed by S. everestense DKP4 and S. abbasi CS1. We appreciate the assistance of Prem Adhikari and Sumitra Ghimire in the laboratory at NARC, Khumaltar, Nepal. We appreciate the assistance of Mr GP Timsina and Dhanik Lal Mandal for collecting and transporting white grubs to laboratory. We thank to Dr. VV Ramamurthy and Shaloo Ayri of National Pusa Collection, Division of Entomology, Indian Agriculture Research Institute (New Delhi) for the insect identification. We also thank Dr. W Wesemael for his support on statistical analysis. The Vlaamse Interuniversitaire Raad-University Development Co-operation (VLIR-UOS), Belgium is highly acknowledged for providing a Ph.D. scholarship to the first author.